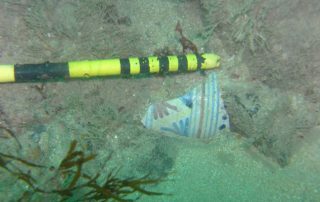 Alderney fisherman, Bertie Cosheril, found a long concreted object tangled up in the back-line of one of his lobster pots. 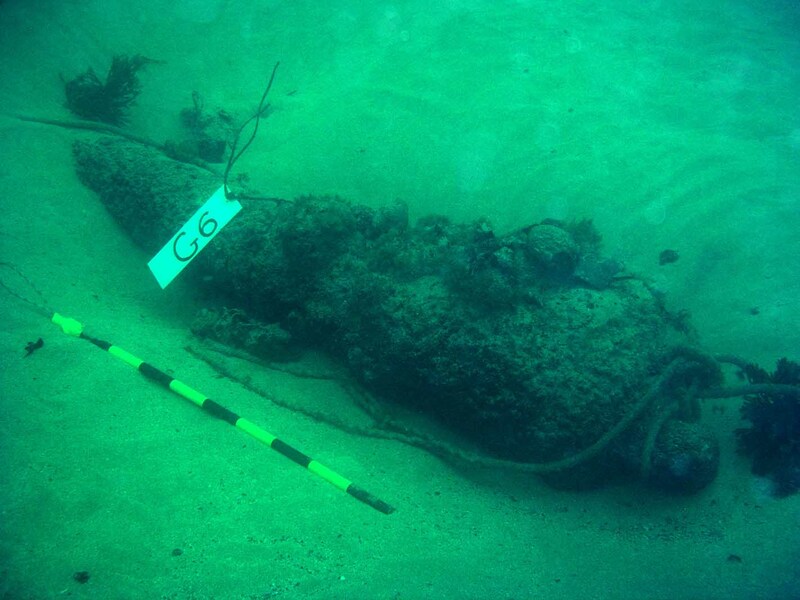 Several days later Bertie took it to the Alderney Museum whose then curator agreed with him that it was most likely a nineteenth century shoulder-arm. 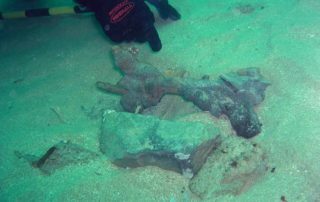 Back at home he broke away the concretion with a hammer to reveal a musket. 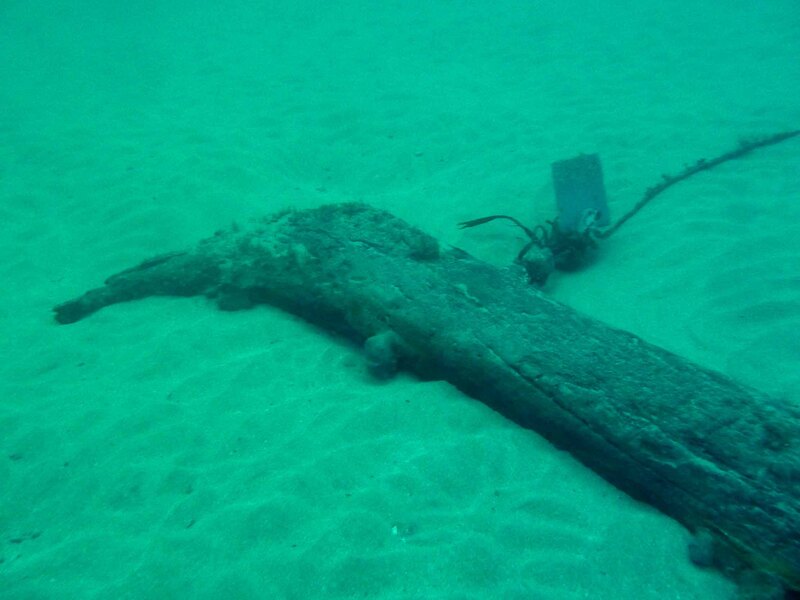 “I hope you find a cannon, Fred”. 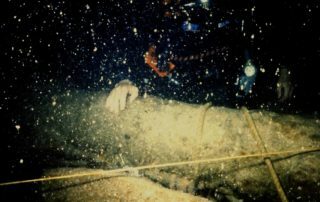 Fred made his descent directly on to a cannon. 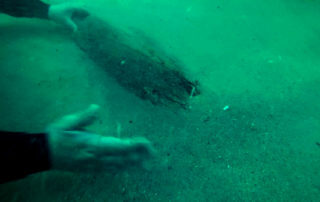 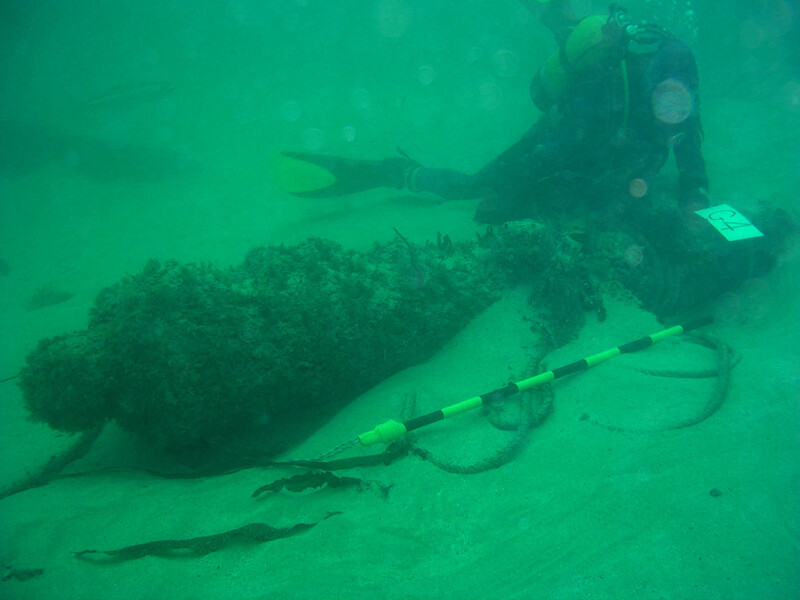 Moving out he found a second cannon and a timber which was ‘flapping slightly in the current’. 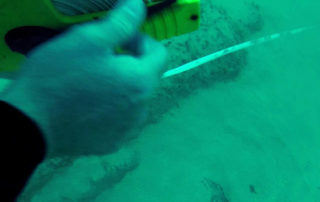 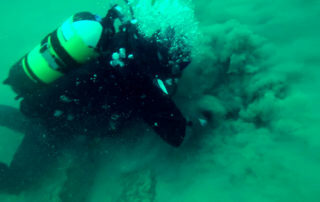 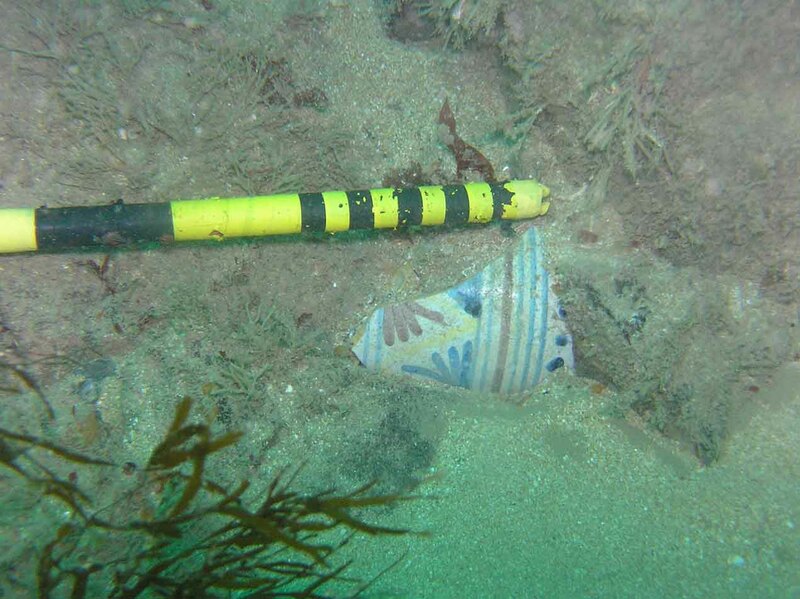 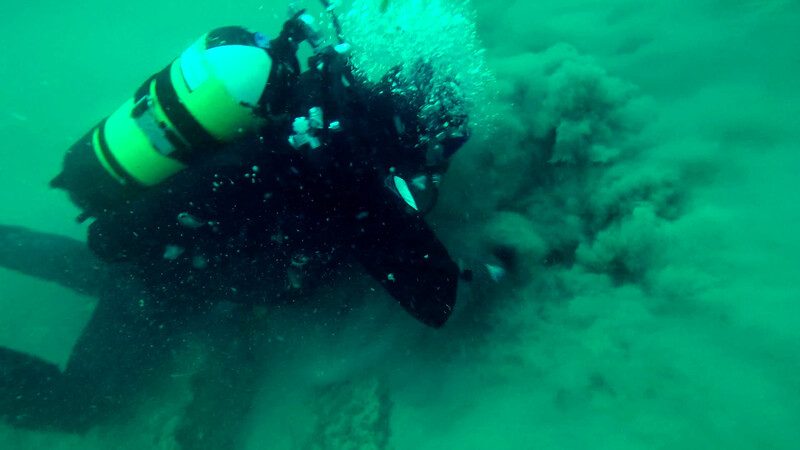 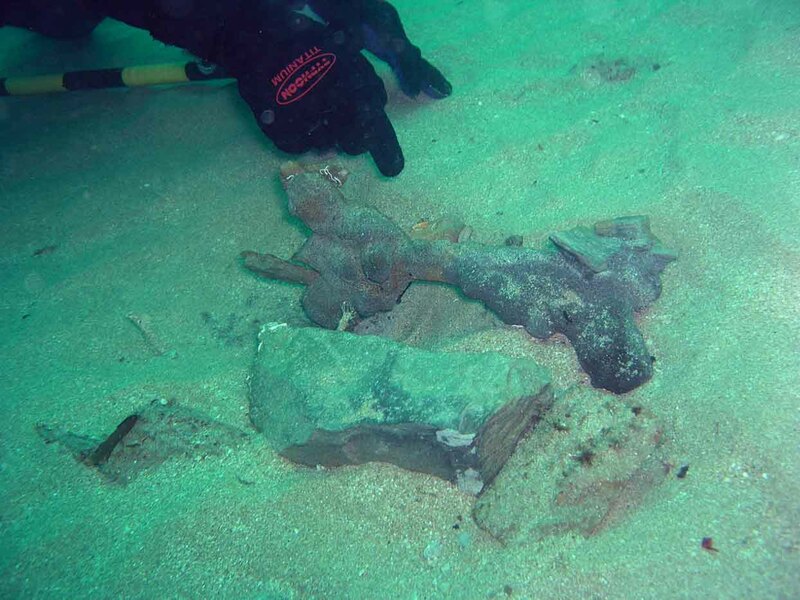 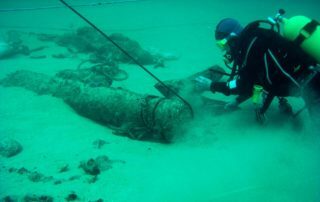 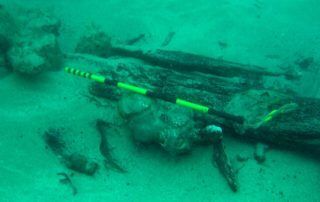 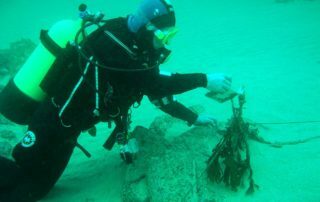 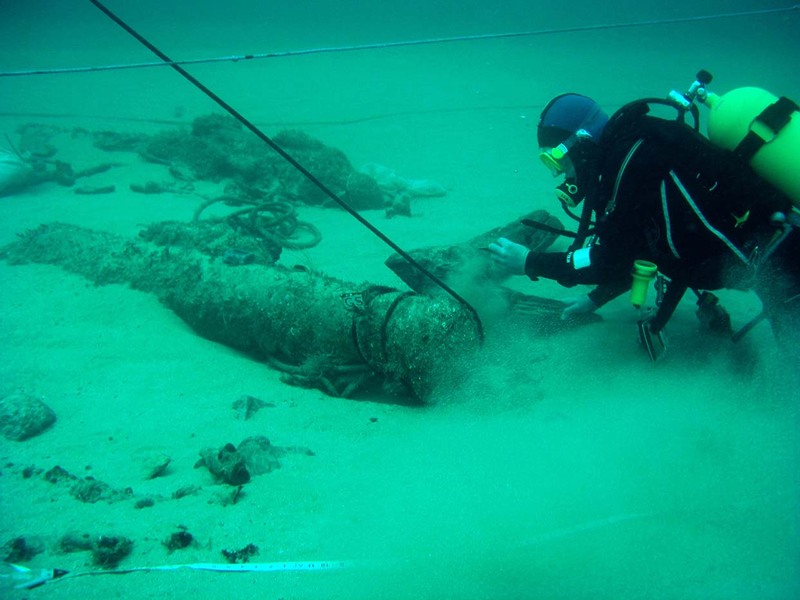 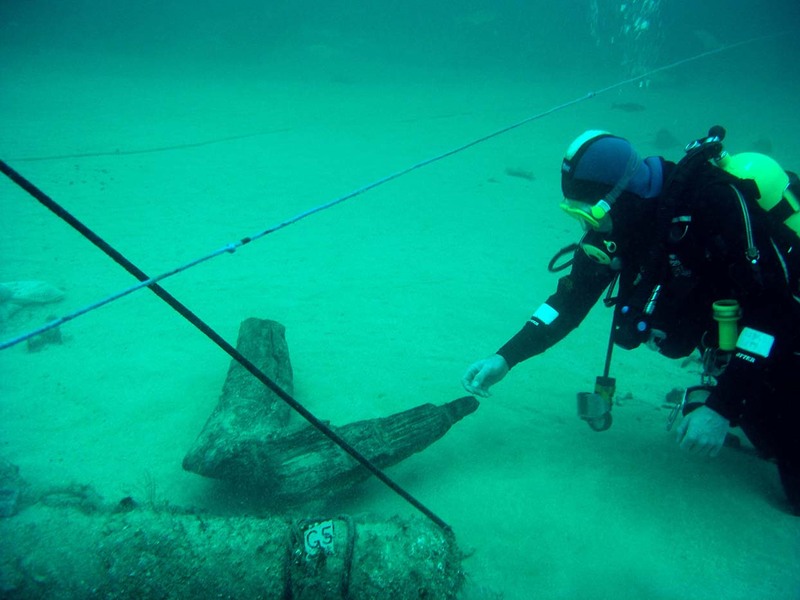 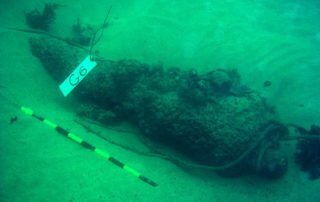 Several further dives were made during which clay pipe 237, gaming piece 1105 and a range of pottery fragments were recovered. 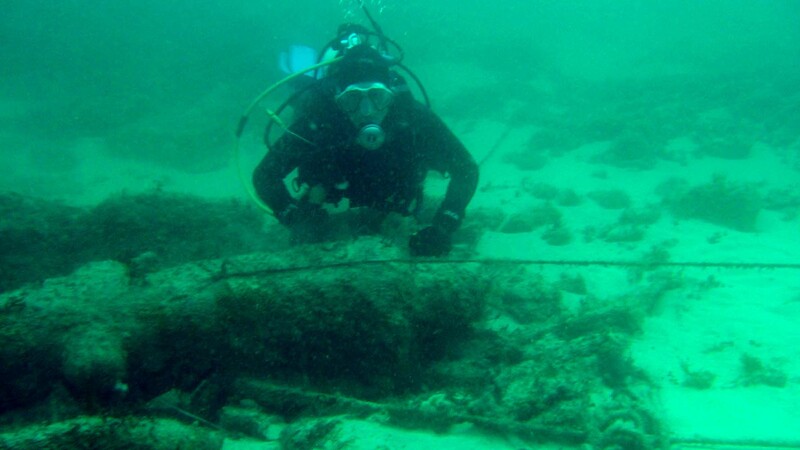 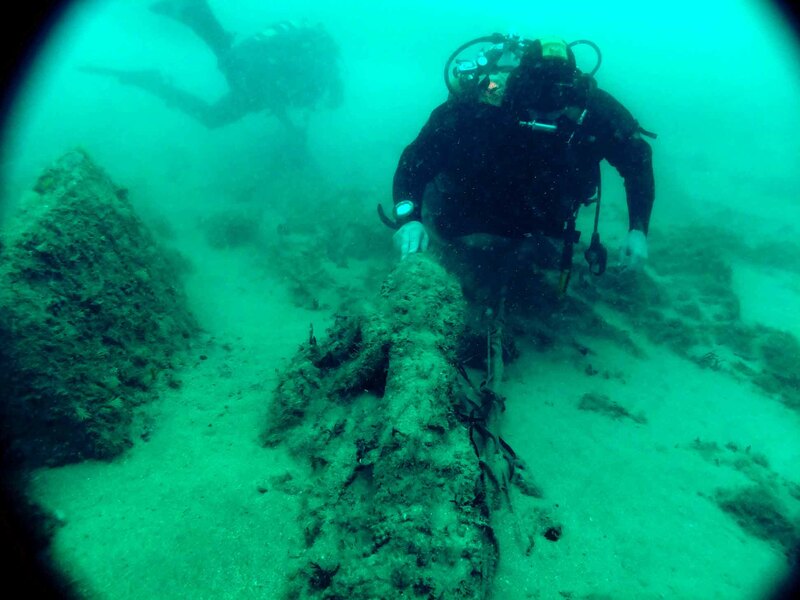 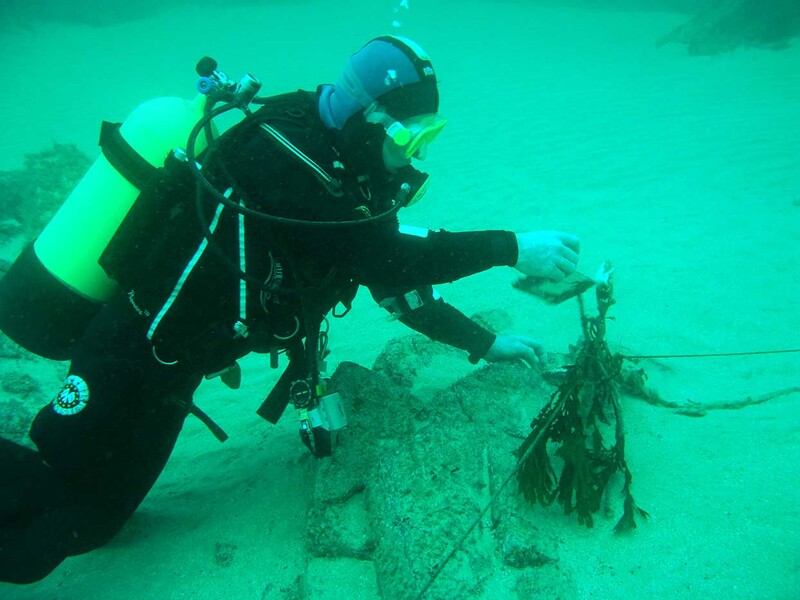 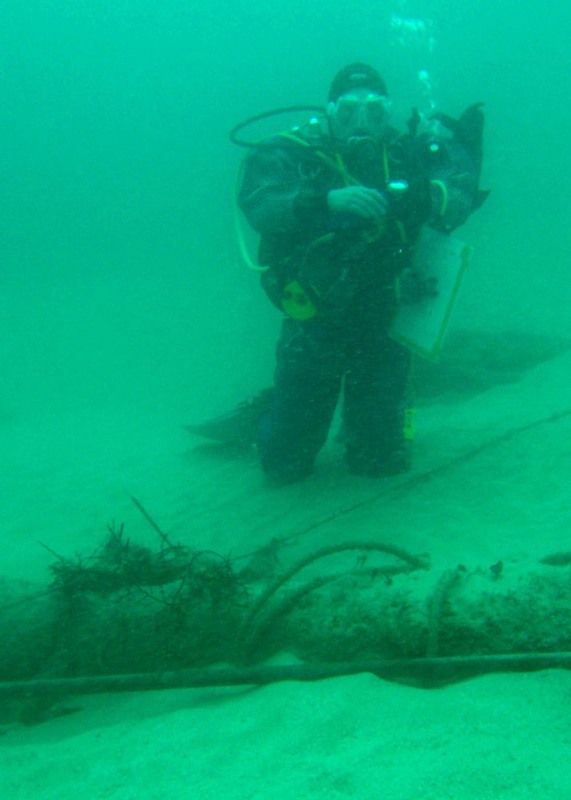 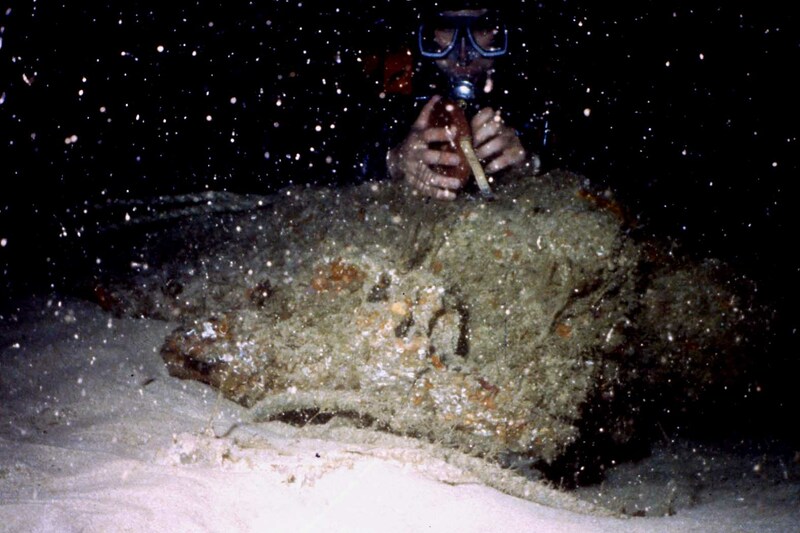 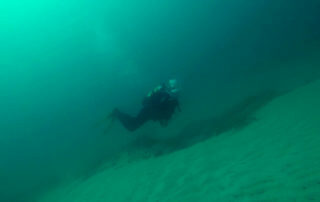 No further diving took place until 1990, but it was not until the following year that the site was relocated and the wreck was tentatively dated to the sixteenth century or very early seventeenth century. 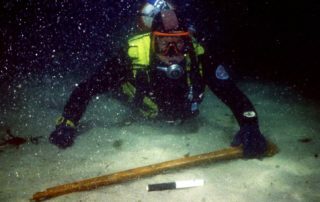 During this phase, which lasted nine months, nearly 200 artefacts were recovered. 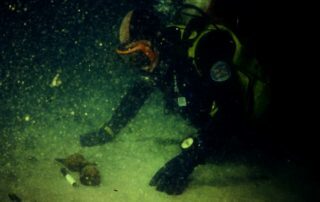 These included a sounding lead, animal bones, muskets, pan weights and additional pottery fragments. 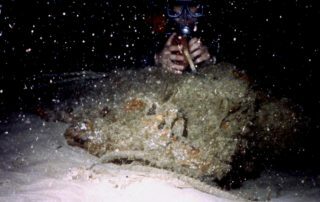 The discovery was announced to the world at a press conference on the 26th June 1992. 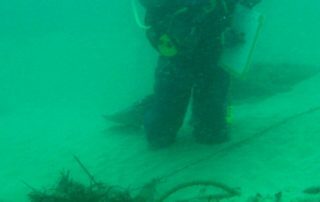 The States of Alderney passed legislation, The Alderney Maritime Trust Incorporation Law 1994, creating the Alderney Maritime Trust to safeguard the wreck and develop it’s archaeology. 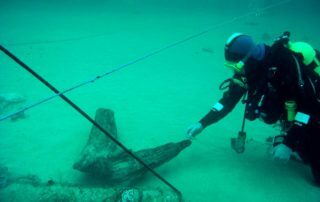 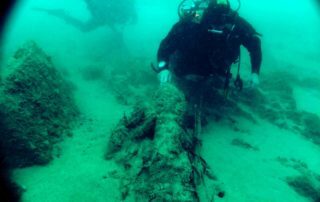 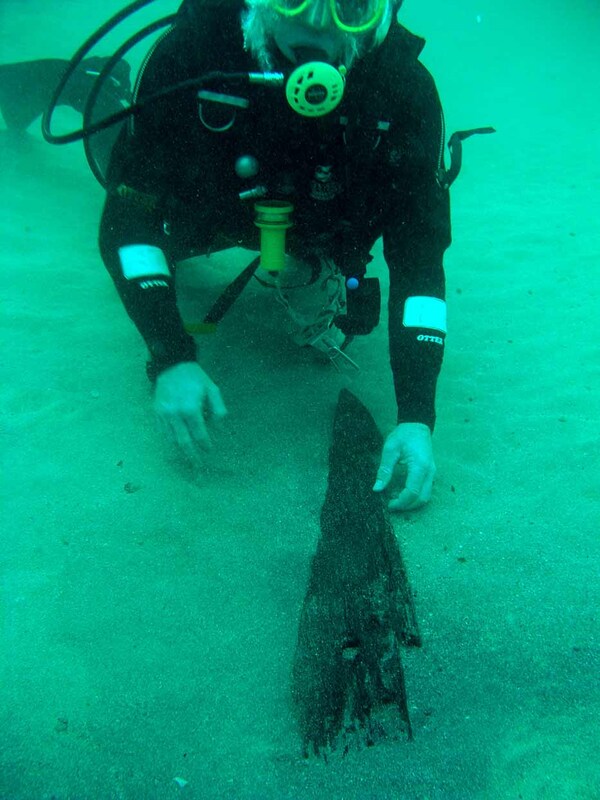 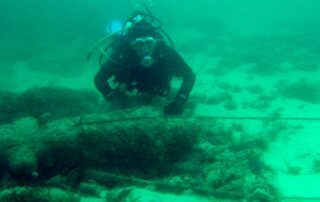 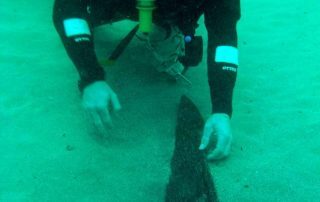 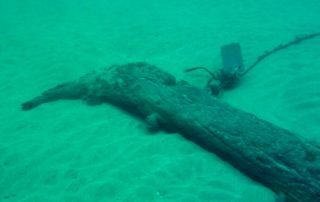 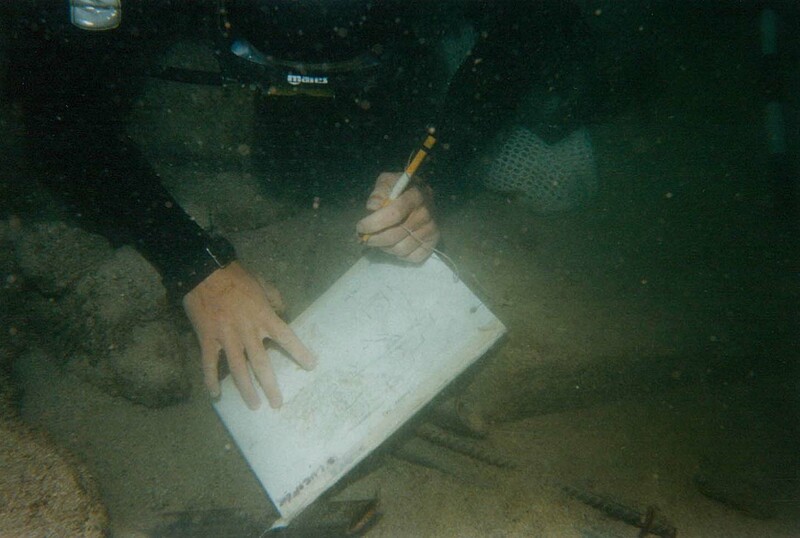 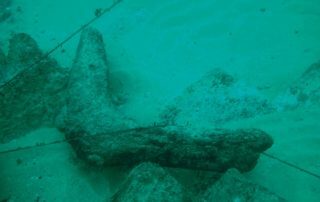 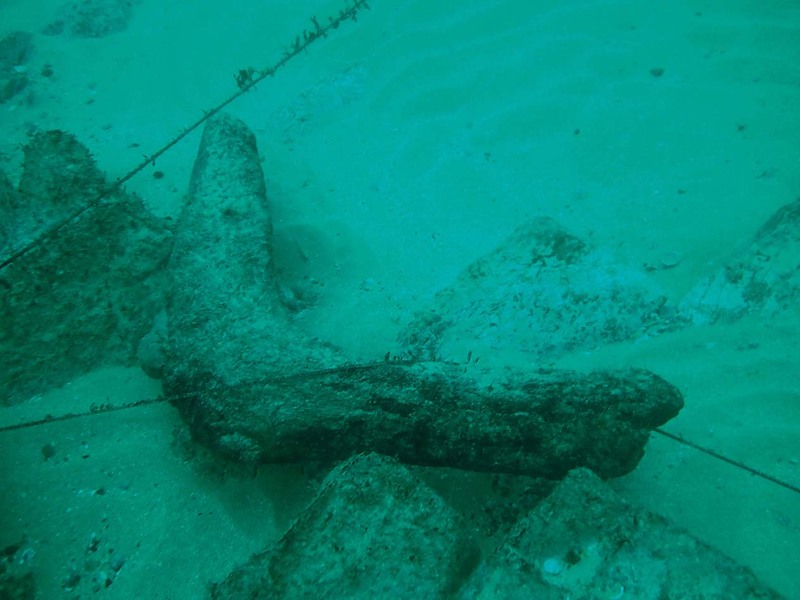 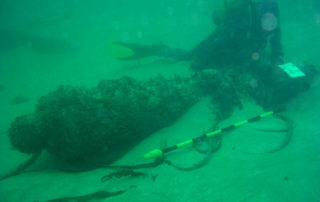 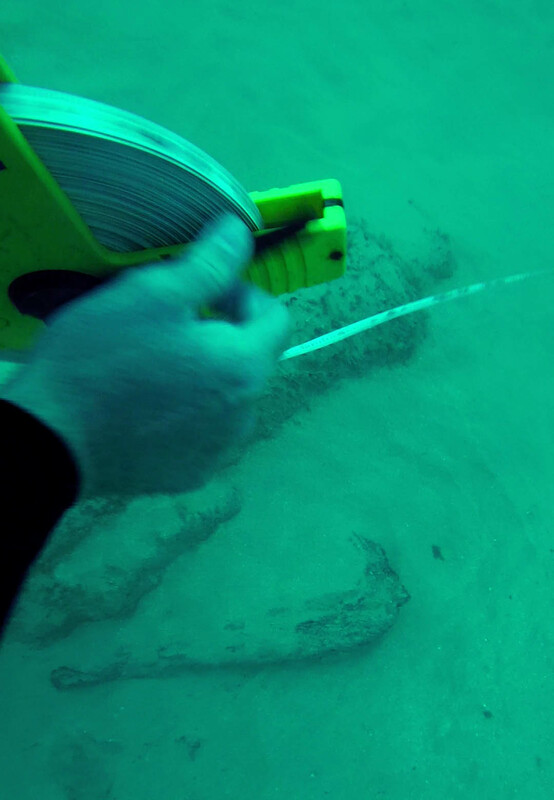 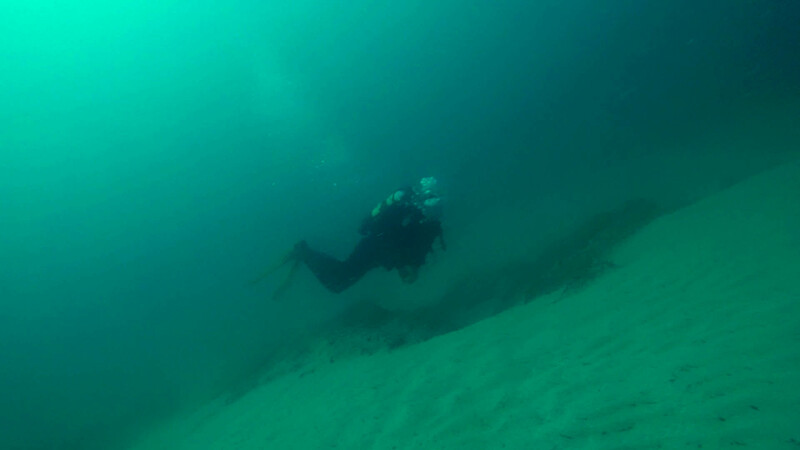 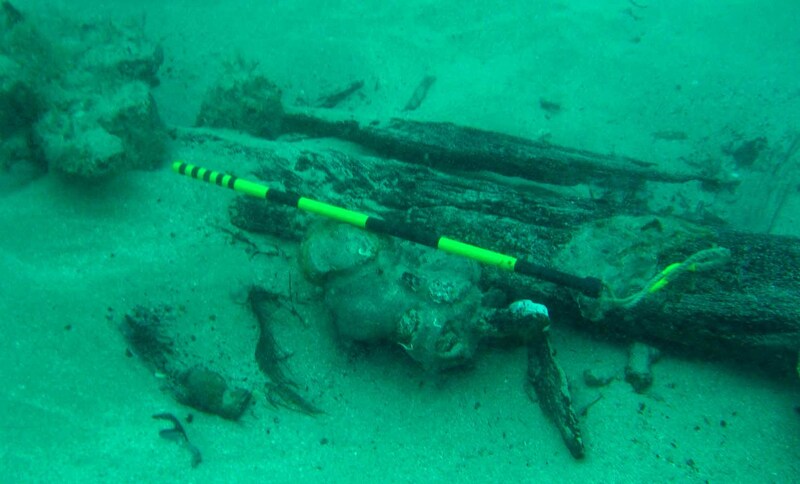 Find out more about the site of the wreck and the challenging physical conditions that affect investigations. 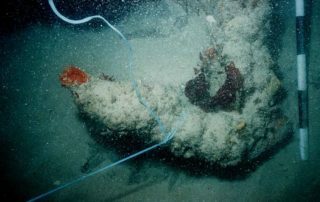 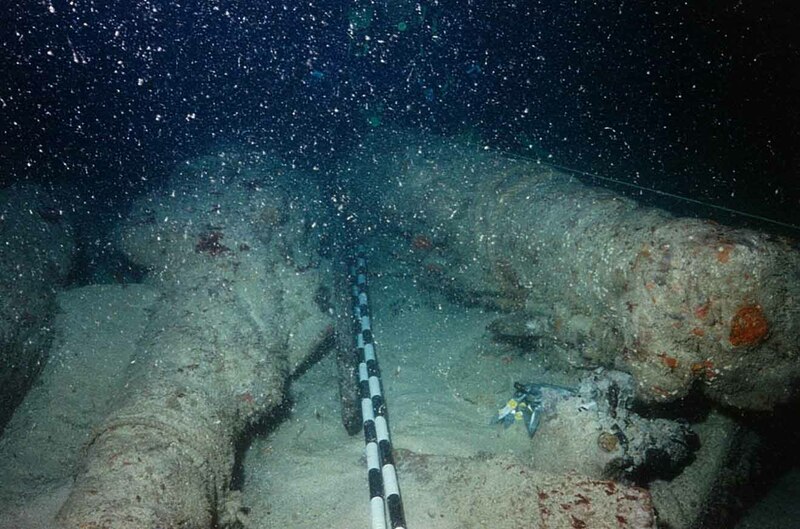 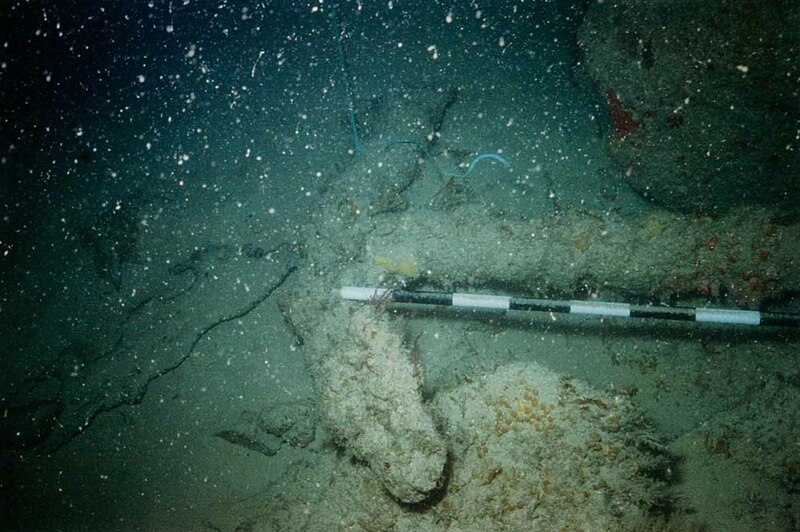 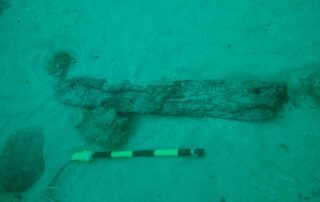 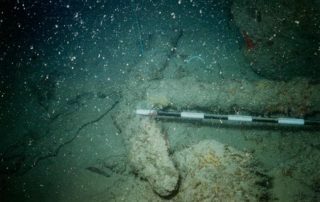 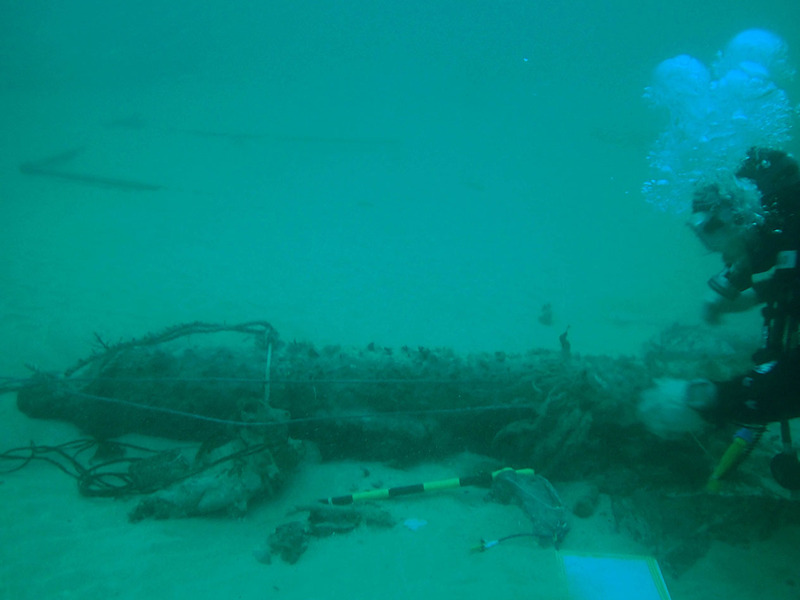 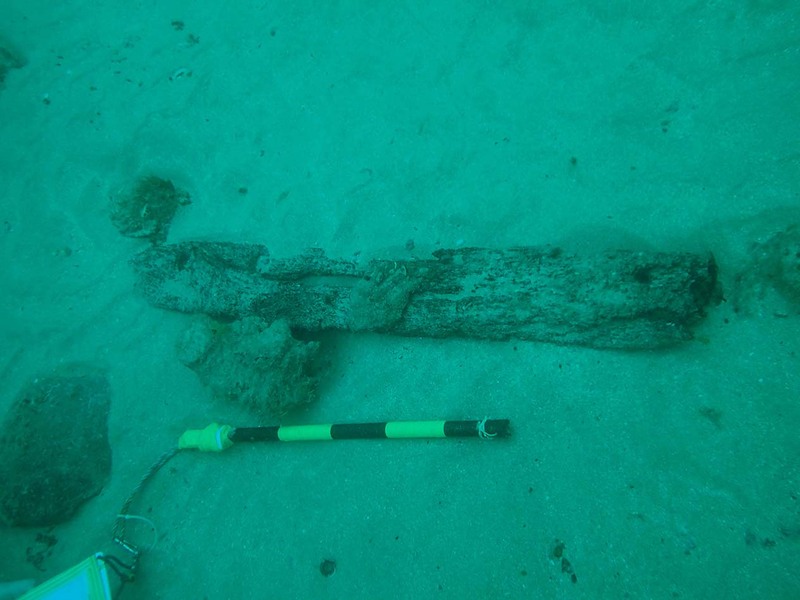 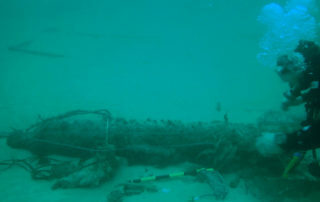 Explore the items which provided investigators with critical information on the chronology, nationality and identity of the wreck. 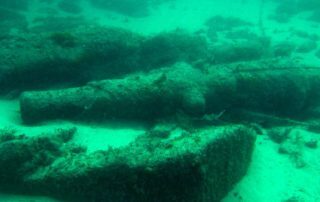 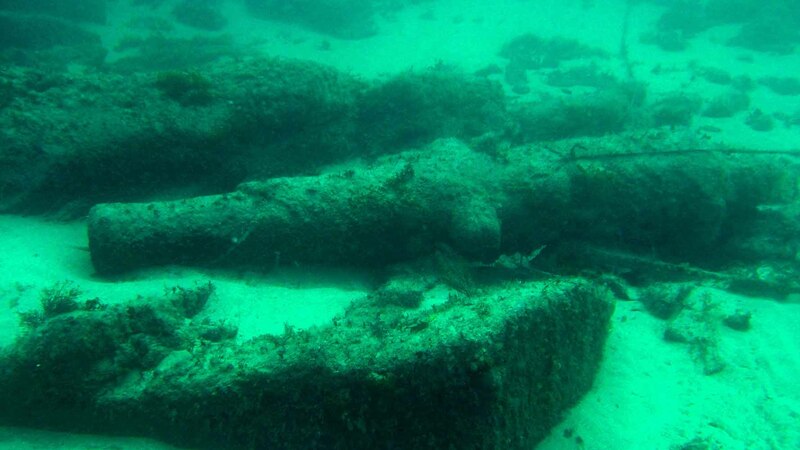 Peer reviewed journal articles, printed/online media pieces and other published material and research on the wreck, its contents and history. 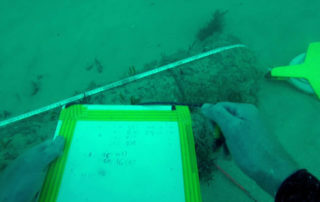 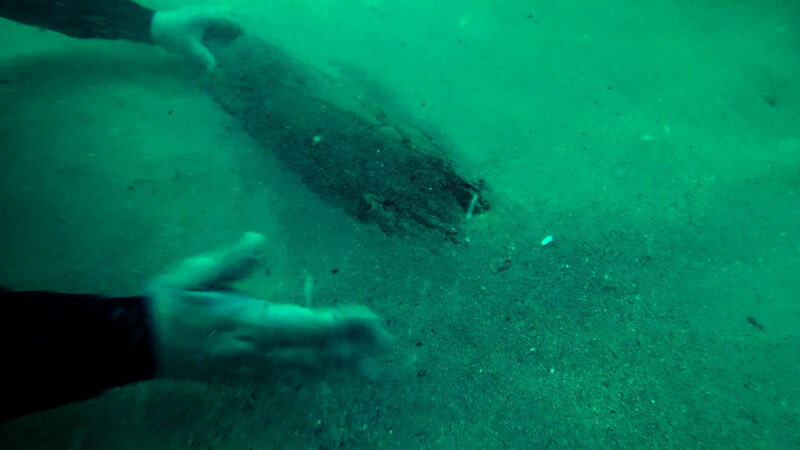 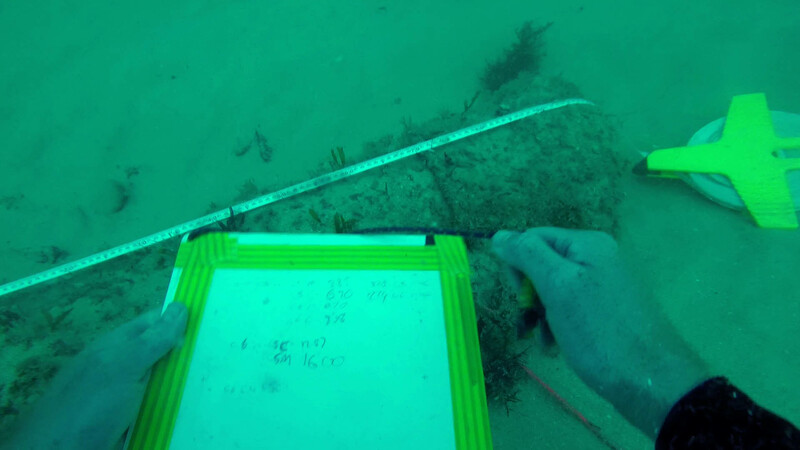 Need to know what we found buried in the sands?